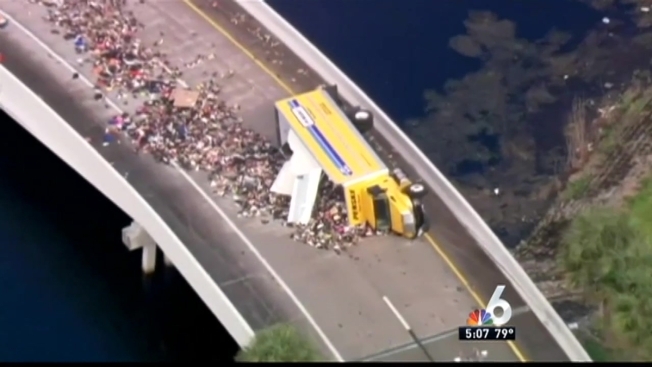 An overturned Penske truck dumped thousands of shoes strewn about the Florida Turnpike near Sun Life Stadium in Miami-Dade. The crash occurred just before 1:30 p.m. Friday at Northwest 199th Street and the Turnpike Expressway. The Florida Highway Patrol said five people were in the cabin of the truck when it flipped. Some of them were taken to the hospital, but authorities said injuries appeared to be minor. According to driver Miguel Marquez, the truck was carrying 32,000 pounds of shoes when it tipped. There were so many shoes, crews needed bulldozers and shovels to clear the road. "Nobody got hurt and I didn't have a car behind me. I got blessed," said Marquez. FHP is investigating what caused the truck to flip over. Marquez said said he was driving 45 mph when it happened. The off-ramp was closed for several hours as crews responded to the scene, but the area has since reopened. The shoes came from New Orleans as donations and were making their way to Haiti and South America.